Ghost is just his nickname, but Castle has been calling himself Ghost ever since the night he and his mom ran away from his dad who was trying to shoot them. Ghost has been running in one way or another since then but he's not doing a great job at keeping out of trouble. One day while he's hanging out after school he sees some kids warming up for track practice. He feels an instant rivalry with a boy wearing expensive clothes, shoes and jewelry. Ghost decides to run alongside the kids trying out and beats all of them which gets the coach's attention. Coach offers Ghost a chance to join the team and he agrees but is surprised to find there's more to it than just running fast and Coach doesn't make exceptions to his rules no matter how talented you are. I could sum up everything I have to say about this book with these words: Jason Reynolds. Everything he writes is multi-layered and beautiful and some part of every book makes me cry. 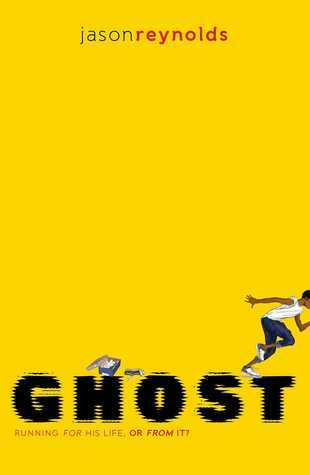 Ghost is not a perfectly charming character - he is defensive, arrogant (defensively arrogant), gets in trouble at school, and does something seriously wrong pretty early on in the book - and yet I liked him and was rooting for him throughout. He learns as he gets brought down a few pegs by Coach, another great character. He finds out that others have their own, serious problems as well. It's short so it won't scare off the kids who don't like to read. It deals with characters who don't have much money. Certainly not enough to just do whatever they want to do without thought about how much it costs. There are very few books dealing with kids who are low income even though the majority of students at my school fall into that category. Ghost's mother is working hard to keep them afloat but she is a strong mother who is still actively involved in raising her son. We don't often see portrayals like this. Generally, if a character in a book is poor, he or she also comes from a bad home. It deals with track as the sport of choice. I'm not sure that will be a selling point for my students, but I think it's something they can all appreciate if they give the book a chance. It has already been checked out constantly at my library so the kids are digging it.